The students are admitted into all U.G courses except B.H.Sc. (Home Science) based on their performance in the state level Common Entrance Test (EAMCET) conducted by Department of Higher Education, Government of Andhra Pradesh. In case of B.Sc. (Hons) Home Science only women candidates are eligible for admission with a pass in two year intermediate Examination with Bi. P. C or M.P.C. Home Science polytechnic students are also eligible. The University shall invite applications from eligible candidates through notification in some of the leading news papers generally in the month of June. The candidates for admission to First Year Under-Graduate courses in the University shall be required to have completed 17 years of age as on 31st December of the year of admission with an upper age limit of 22 years for all the candidates, 25 years in case of SC and ST candidates and 27 years for Physically challenged. The eligible candidates shall be required to attend personal counselling perusing as per the intimation/notification in the News papers and be admitted to different U.G Programmers depending on their individual merit as determined by the rank' obtained in EAMCET following the presidential order (Regional allotment), the rule of reservation as per orders of the Government of Andhra Pradesh. a) Backward Classes = 29%; BC - A -7%; BC - B -10%; BC - C -1%; BC - D -7%; BC - E -4%. One per cent each under Visually, Hearing, Orthopaedically impaired categories.
" Forty percent of the seats in B.Sc. (Ag. 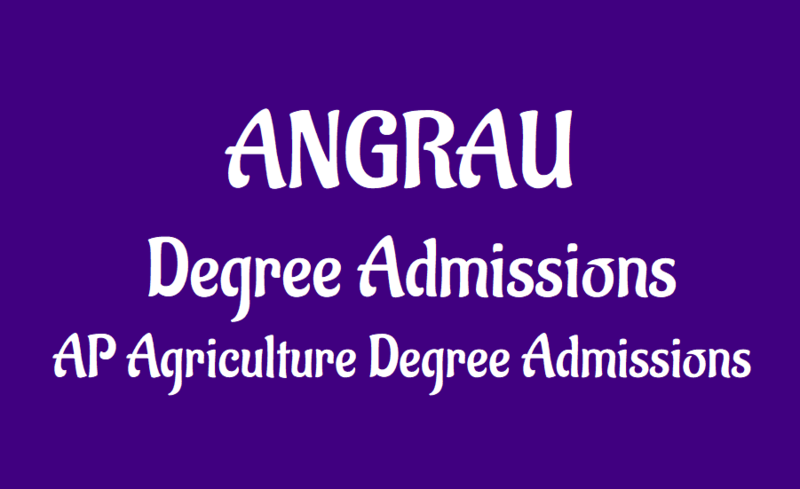 ), B.Tech (Ag. ), B.Sc. (CA&BM) and B.Tech. (Food Science & Technology) courses are reserved for candidates coming from families of Agriculturists actually engaged in and owning not less than 3 acres of land and who have studied for a minimum of 4 years in schools located in Non-Municipal areas. Candidates seeking admission under this category should produce a certificate in Form 3 of application containing patta numbers and extent of land obtained from a Revenue Officer not below the rank of Mandal Revenue Officer of the Mandal Concerned or a certificate copy of Pattadar Pass Book issued by the Mandal Revenue Officer and also a Certificate in Form 4 of Application from the Heads of Institutions that the candidate has studied for a minimum period of four years in Schools located in Non-Municipal areas during their period of study from 1st class to 12th class (Intermediate). "If the certificates as prescribed referred above are not filled in Proforma in the application form duly signed by the concerned Head of Institution or officer mentioned above along with office seal, the claim of the candidates under this category will be rejected. 1. No need to pass through EAMCET. 2. Only women candidates are eligible for admission into this course. when is ag bsc phase 2 counselling?? i got 8013 rank in ap eamcet & i am bc-d local.can i get a ag bsc seat? Great work sir!! Would love to be a part of your great work.